I am an Auntie to 7 fantastic kids. 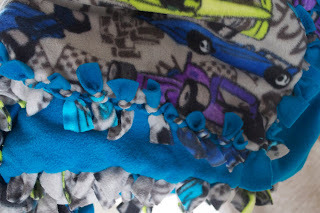 After my first niece and nephew were born I made them blankets, not realizing the commitment I would feel to make each one of the kids blankets going forward. 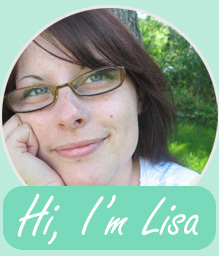 That said, the blankets I made were not at all hard so I haven't found it too daunting a task to make more. Thank heaven I didn't make quilts! sheesh! 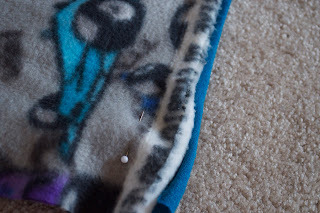 Lay your fleece flat, right sides facing, pin and stitch along one short end (the top). Trim, so it lays nicely when flipped so right sides are facing out. With right sides facing out snip into the fabric along the two long sides and remaining short side. I'm crazy about making the tabs all the same size so I always make a little cardboard guide, roughly 1"x 3". I also pin the materials together so there is no shifting during the next step. 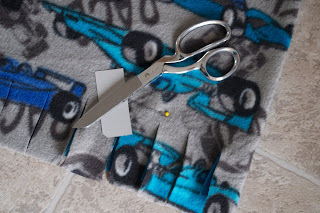 Tie knots into the fleece using the front and back pieces of the tabs you just cut. Easy-easy, super cozy and always appreciated! 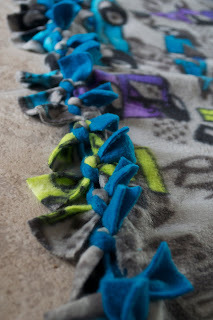 I make these blankets too! So easy to do!